With a team of six dedicated lawyers, we have the capacity to provide efficient service at short notice and at any location. 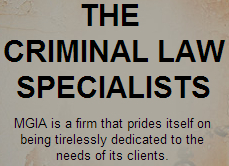 Regardless of when and where someone is arrested, we ensure prompt assistance 24 hours a day, 365 days a year. Being arrested and prosecuted is a traumatic process with potentially devastating consequences. Regardless of how serious or how potentially unpopular the charges you may be facing appear, you can rest assured that Mathewson Gess will fearlessly represent you throughout this daunting process.